Your LastPass sites will be converted into 1Password logins. Secure Notes become different items depending on their type, like Bank Account, Driver License, or Secure Note. Form Fills and documents will not be imported. When you export from LastPass, you’ll copy your unencrypted LastPass data to the clipboard. To keep your data safe, quit any apps that keep track of text you copy, like a clipboard manager. Sign in to your account on LastPass.com. Click More Options in the sidebar. Choose Advanced > Export and enter your LastPass password. You’ll see your LastPass data in a new tab. Select all the onscreen text (Command-A). Copy the selected text (Command-C). Select all the onscreen text (Ctrl + A). Copy the selected text (Ctrl + C). Click LastPass. Your Personal or Private vault will be selected. To import your data to a different vault, choose it. Paste your LastPass data: right-click (or Control-click) in the text field and choose Paste. Click “Take me to my imported items”, and you’ll see all your imported items. If you want to change anything about the import, like importing the data into a different vault, click Undo Import and start again. Uninstall LastPass to avoid conflicts with 1Password. LastPass may export some characters as HTML entities. An HTML entity is a group of characters that begins with an ampersand (&) and ends with a semicolon (;). They’re used in HTML to display characters that would otherwise be interpreted as HTML code. For example, &lt; is four characters, but that HTML entity represents the single character < (less than). 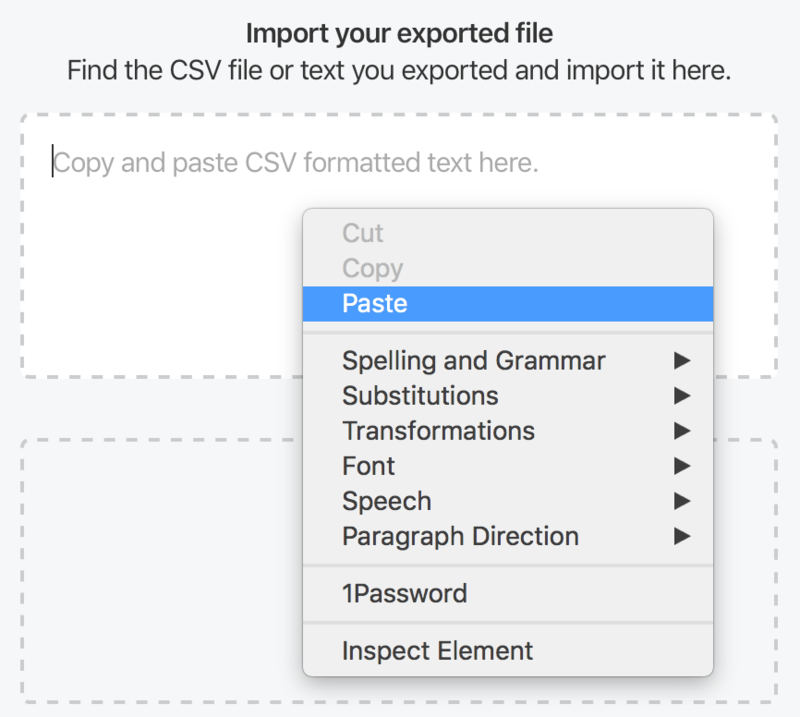 1Password imports HTML entities as the characters they were intended to represent (<), but the original values (&lt;) are also included in each item in the “Original Values” section. If you’re still having trouble importing your LastPass data, contact 1Password Support.